An animated GIF collaboration between Leon Reid IV & Ryan Seslow. The GIFs were created as additional proposal materials for an up and coming public art collaboration project to be installed on the campus of Long Island University’s Post Campus, Brookville NY. 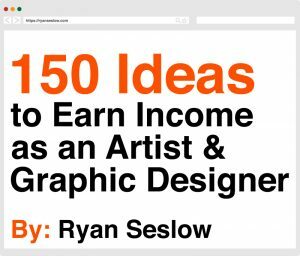 Leon Reid IV visits Ryan Seslow’s Studio. Leon Reid IV is one of favorite artists. I met Leon through our mutual friend John Fekner who had mentioned that we had a lot in common. Indeed he was right. I reached out to Leon and invited him to participate as a guest artist and speaker in my course at LIU Post titled: “The History & Emergence of Street Art & Graffiti.” Prior to the lecture, in June of 2012 I did a visit with Leon in his Brooklyn studio. Inspired? I was beyond inspired by his work, his work ethic and philosophy, and his process. It was during this visit that we talked about the presentation he would prepare for the guest lecture, as well a new project that we are currently collaborating on. I can’t go into the details now, but in 2013 we will be installing a series of public art sculptures in NY. Stay tuned for that. This past week Leon came to visit my studio for the day. We caught up on some project details, had some pizza, and also created this piece below. I documented the process to share the energy. 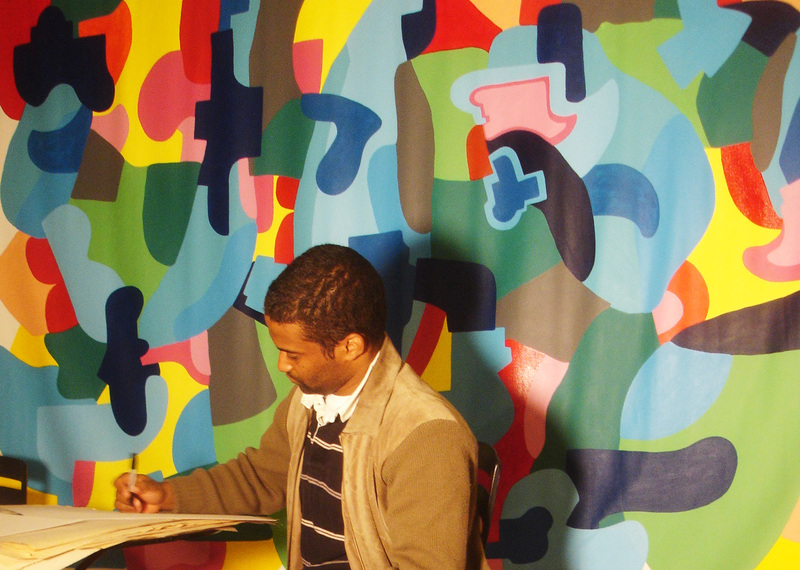 Leon draws as the large canvas I am working on chills in the back drop. This colorful piece has evolved into a newer more subjective style for me. It commands larger canvas’ and dictates the color and composition as I work. Before Leon arrived I had laid down a back-round painting in acrylic on a canvas board I had put aside. We began creating illustrations that would later be cut out and pasted down to create the composition. The idea was to work with the immediacy of the moment. As Leon put it: “to draw what was on one’s mind at the time.” I love the medium of drawing for this reason. It can be as quickly expressed as the spoken word, or the action of dancing. Working on a piece of bristol paper, and armed with sharpies, we got busy. Leon is a great and animated story-teller, as we worked I learned a lot about his past as graffiti writer VERBS. 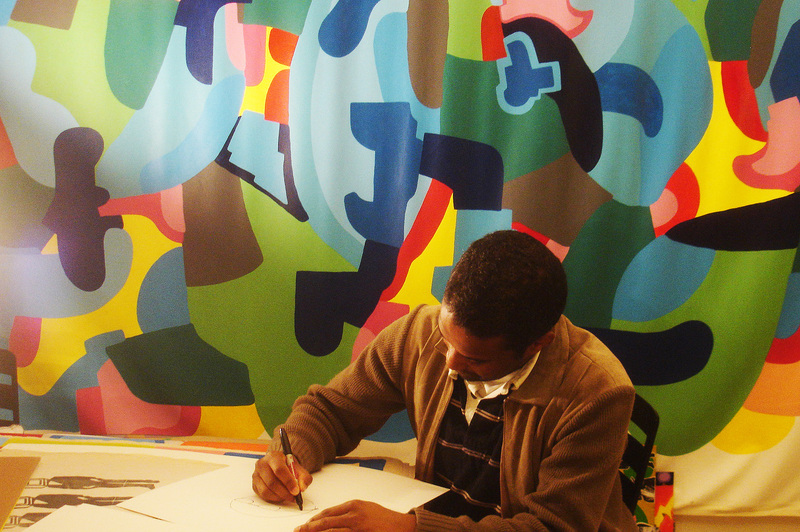 Above, Leon laying down his hand style and a classic graffiti style arrow with a sharpie before the illustrations were to be composed and pasted down. I then added my tag and hand style as well. The final illustrations were first soaked in water for a few minutes. The wet image allows for a flatter adhesive to the canvas board once it has received a layer of glue to the surface. Much like the wheat pasting process, but the glue can be kept and sealed for a longer amount of time, and never spoils. The glue also leaves a nice clear matt finish. All in all, the piece took about 45 minutes to put together. Good expressive fun was had all around. Leon’s sun character and hand-style fit well into the top right corner, I then added my two character illustrations below to give the impression that the sun was above them. I love the overall simplicity and positive feel from the piece. The black and white cut outs contrast and compliment the colorful back-round. The final piece, 18″X24″, acrylic & hand drawn illustrations pasted down on Canvas board. 12/20/12. I know, not such a great quality photo, I’ll update that soon.